Cuisine at home magazine is dedicated to showing cooks how to enjoy and experiment with new ingredients and recipes in their kitchen. 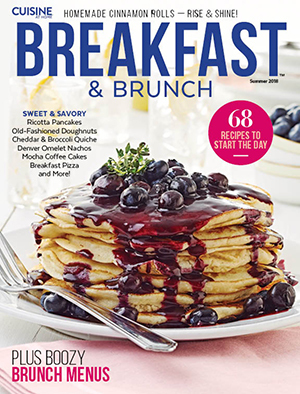 Each bi-monthly issue features a wide variety of dishes to satisfy everyone’s food cravings—from authentic specialties from around the globe to restaurant favorites to all-American dishes with updated flavor twists. Great menus make meal planning easy. The hows and whys of cooking are explained in detail in regular features like Cuisine Class and Cuisine Technique. Step-by-step details and a photograph of the finished dish accompany every recipe. 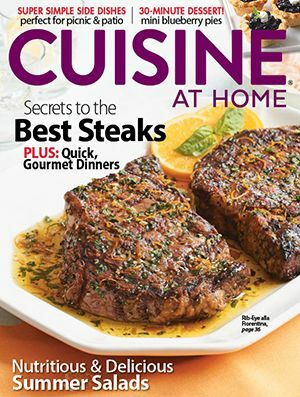 Cuisine at home magazine offers popular features such as Tips from Our Readers, Test Kitchen Favorites, and Q & A. Celebrations focuses on recipes for entertaining, and in our specialized recipe sections, like Cuisine for Two and Wise Bites, readers find other delicious recipes that fit their lifestyle. Like all August Home publications, Cuisine at home is 100% editorial with NO ADS. Cuisine at Home‘s Breakfast & Brunch cookbook with 68 delicious recipes to start the day. From fabulous French toast to hearty hash browns, a great morning meal is within reach any day.